This article, originally published under the title "An Anti-Israel Brigade With Ties To Hamas Finds A Home In San Francisco State University," has been slightly edited. 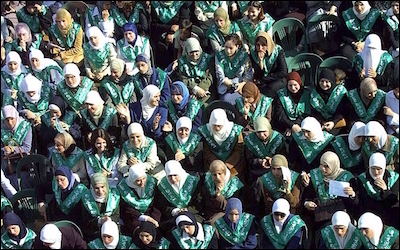 Palestinian women wearing green Hamas shawls at their ceremony graduating from An-Najah University in Nablus, June 7, 2003. Opponents of academic accountability and apologists for terrorism alike are seething with fury over a campaign by the Middle East Forum and Campus Watch to end San Francisco State University's Memorandum of Understanding (MOU) with Hamas-dominated An-Najah University in the West Bank. Accurate criticism of a taxpayer-funded institution and extensive documentation of An-Najah's ties to radicalism and terrorism go unanswered, while accusations of "McCarthyism," "Islamophobia," and "hatemongering" by "Zionists" abound. Predictably, SFSU's General Union of Palestinian Students (GUPS) rushed to defend MOU architect and faculty adviser Rabab Abdulhadi (who is also director of SFSU's Arab and Muslim Ethnicities and Diasporas Initiative) with a cliché-ridden statement accusing Campus Watch and other "Zionist organizations" of "racism," "Islamophobia," and, most absurdly, "anti-Semitism." An-Najah's ties to terrorism go unanswered by critics of the Campus Watch campaign to end the MOU. The Samidoun Palestinian Prisoner Solidarity Network released a statement claiming that Campus Watch and other "Zionist groups ... target Palestinian academics in the United States . . . [and] operate hand in hand with the violent military raids and pre-dawn arrests against Palestinian student activists at An-Najah." Translation: those who object to relentless defamation of Israel on campus are as guilty as dastardly Israelis, and you know what we do to dastardly Israelis, right? The 2016 Prisoner, Labor, and Academic Delegation to Palestine - a group comprised of radical activists and academics with whom Abdulhadi traveled to An-Najah earlier this year for an MOU-facilitated conference - equated Campus Watch's campaign with "an escalating backlash by pro-Israeli, Zionist organizations to undermine support for Palestine." The U.S. Campaign for the Academic and Cultural Boycott of Israel (USACBI), of which Abdulhadi is a founding member, accused MOU opponents of engaging in "McCarthy-like tactics." 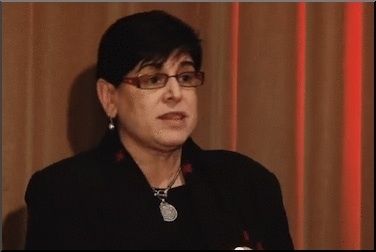 Professor Rabab Abdulhadi has worked to forge "collaborative agreements" between San Francisco State University and two Palestinian universities. Abdulhadi herself resorted to the same tiresome banalities, describing Campus Watch's effort to end the MOU as a "McCarthyist attack" and "a witch hunt campaign." She maintained that the campaign "seeks to whip up hysteria, Islamophobia, racism, and xenophobia to divert attention from Israeli criminality." In an open letter to SFSU President Leslie Wong, California Scholars for Academic Freedom (CSAF) described Campus Watch's efforts as a "slander campaign" centered on "exploitation of Islamophobia" and "the stereotyping of Arabs and Muslims as terrorists," led by "the pro-Israel lobby," a "well-financed network of special interest groups." California university faculty from SFSU and elsewhere issued a statement addressed to Wong expressing support for Abdulhadi and other "campus advocates for justice in/for Palestine" against "baseless accusations of terrorism and anti-Semitism." Indeed, they complained that Wong hadn't issued a sufficiently full-throated defense of the MOU, even though, the statement noted, Abdulhadi "was encouraged by SFSU to establish a collaborative agreement" with An-Najah. They have a point – in 2015 Wong praised the MOU and Abdulhadi for being among a "group of radicals" who were "a means of making one of my goals and dreams come true." Why so muted now? Stanford University professor and Boycott, Divestment, and Sanctions (BDS) movement activist David Palumbo-Liu called Abdulhadi a "target of harassment" and condemned the "overreach of some pro-Israel organizations into campus free speech," equating criticism with attempting "to silence, smear and intimidate those with whom they disagree." 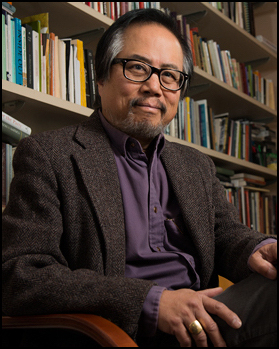 The Middle East Studies Association (MESA) sent a letter to Wong defending Abdulhadi from alleged "harassment," whitewashing An-Najah's terrorist ties, and denouncing the Middle East Forum as one of several "politically motivated nonacademic organizations which seek to stifle perspectives on the Israeli-Palestinian conflict" - another baseless charge. The MOU defenders don't bother to seriously dispute the substance of Campus Watch's complaint: An-Najah's radicalism and Abduhadi's documented association with terrorists. Instead, they prefer to demonize those who have a different position on SFSU's partnership with An-Najah. For the record, Campus Watch is not part of any lobby, nor is it "McCarthyist," as it lacks the federal power to enforce its beliefs. These intimidation tactics won't work. As Middle East Forum president Daniel Pipes stated in his reply to MESA, "Campus Watch, the Consumer Reports of Middle East studies, will remain on their case so long as the need continues for its services."